How is the reliability? Also will it fit in a m1 carbine folding stock? I think not hearing anything about them EVER, says quite a bit about them. I looked at one when they first came out as I had lusted for one. Stood there with this thing in my hands begging me to take it home as I had waited months for them to be available. Once I held it and got to see first hand how it was built.....I handed it back and walked away. I have never regret ed leaving it at the shop...there is a reason they are on sale now....they can't get rid of them. One of the few 9mm carbines I have ever left on the counter and walked away from...that and the Taurus 9mm carbine. Haha, Well, you didn't say anything good. I handled one at Big 5 last week. No likey. The charging handle doesn't hold one side of a rotating bolt like a real M1 Carbine--it is actually more like an open-top slide that is on BOTH sides of the bolt. The one I handled was binding up pretty badly just before returning to battery. The only thing that could really be said about it is that it looked KINDA like an M1 from across the counter. That's disappointing. Seems like there could have been a good market for them. Well.....there were some M-1 carbines made in 5.7 Johnson Spitfire. 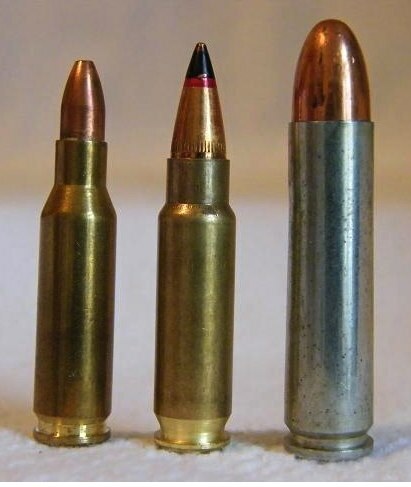 (5.7x33 or .22/.30). Very rare. Some time back a private seller on Gun Broker actually sold one for $750 still unfired! Steal!! I could have bought one many years ago.....real collector item today. Seems I saw reloading dies for them at one time. Mr. Johnson was ahead of his time back in the 1960's when he designed this. In the 1960's the M-1 Carbine was the AR-15 of its day. Lots of them on the market with many companies building them out of surplus parts. Real shame they screwed the pooch on this one. Almost like I'm better off grabbing a Marlin/Ruger Police Carbine and throwing some techsights on it. Don't have the 9mm, but i do have the 22lr. Its a piece of junk. 30-40% FTF, FTE. I send back for warranty work and still does not work. After a year, they said the warranty expired and I am on my own. The wood stock is nice, and thats about it. Gun is mostly plastic. If you can find a decent PC9, get it. They are reliable and built like tanks, you won't regret it even though the trigger could be much better. I have owned a couple of Marlin Camps. If you put the Black Jack buffer in them and the slightly heavier Wolff action spring they are very robust and reliable. The Ruger PC9 is a Ruger...which is to say its built like a tank and may well last forever. Both are fine choices and VASTLY better than that Wanta-Be 9mm M-1 carbine. I own three (two 9s and a 45) and I wouldn't shoot +P through any of them, even with the BJ buffers, and certainly not +P+; I'll shoot anything through the PC9 that I would my UZI, no sweat. YMMV. But yes, I agree, I think either (or a Storm, if the B92 mags are a plus for the OP) would be preferable to this M1-ish 9mm from what I have read (haven't shot one yet). Many have fit the Camp with the heavier (21# ??) Wolff spring and the blue buffer and shot the +P stuff in them without issue. However, I have never seen a good reason to shoot +p or +P+ ammo in every day use. That ammo was made for military sub-machine guns that were built for it. If you put the heavy springs in some blowback 9mm's they then don't like all "stock" ammo. I find a happy compromise is the "middle" spring Wolff makes. It seems to work just fine with all standard ammo including the ammo I normally shoot, mild loads. While some just have to shoot the hottest loads they can find years of "the school of hard knocks" taught me that its not always a good idea to beat up the gun with hot loads just to shoot targets at the range. Normal power loads work just fine. In fact I reload and like many prefer to go with "medium" power loads. Easy on the gun, easy on the shooter and things last forever. I do have personal defense loads for home security but prefer not to shoot much of that stuff for practical reasons. Test it to insure its reliable and then set it aside for "duty". The M-1 9mm I held and examined was very plastic looking. It did not seem very well made at all. Considering that companies track record with the .22 they stuck people with I ran away from that rifle as fast as I could. Once again Arfcom delivers valuable intel. For those that posted about the citadel, thanks for saving me money.